If you've not heard of these two products you've definitely been hiding under one massive beauty product rock! I recently ordered the Origins Super Spot Remover (review here) and as a bonus for purchasing online I got to choose a few sample products to try out. I picked up the VitaZing Energy Boosting Moisturiser and GinZing Refreshing Eye Cream amongst a few. 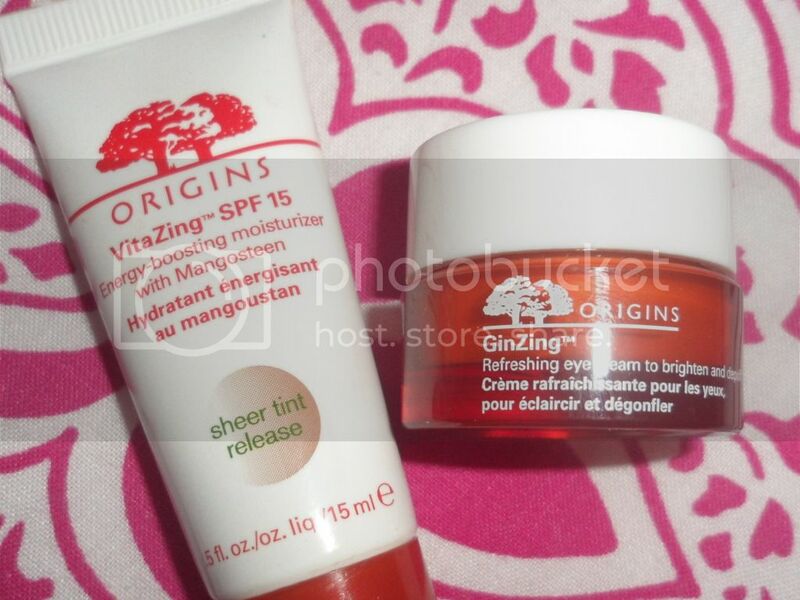 Origins VitaZing is a product I've been wanting to try for a while now. It is basically a light day moisturiser with a sheer tint, to perfect skin tone and leave it with a "holiday glow". The active ingredient is Mangosteen which has traditionally been used to treat skin problems due to its anti-inflammatory properties. It's an oil free formula which feels light and fresh on the skin. The tint leaves a natural looking glow and imperfections in my skin tone appear less visible. In no way is this a replacement for foundation or even tinted moisturiser in my eyes, but it makes a great base for foundation. I do however feel that when I use this product, my skin is slightly more oily than usual at the end of the day, but on the other hand my makeup looks a lot better and applies with greater ease. Overall, this is not a saviour or must have product in my opinion, but I am really enjoying using it. I will probably be repurchasing a full sized one nearer Spring time when I will be favouring less make up and a fresher look to the skin. Origins GinZing is a brightening eye cream which aims to hydrate and de-puff the eyes. The product itself is a pearlescent tinted cream, with a slight 'foundation scent' to it. Caffeine, ginseng and magnolia extract all combine to pep up, brighten and disguise dark circles, instantly faking a long restful nights sleep. I have absolutely loved using this moisturiser! My eye area is not only hydrated but bright, and using it has lessened my need for under-eye concealing. It has been such a life saver after a heavy night out and an early start to work, I dab this under my eyes and all evidence of the previous night is gone. I will definitely be repurchasing this! A little goes such a long way and I can see this little 5ml sample lasting an age. I've never tried any origins products... where do you get yours from? I bought mine from the Origins website... I actually bought the Super Spot Remover and got to choose 3/4 samples too and these two were my favourite. I'm thinking of buying more Origins skincare things, I've really like the stuff I've tried! Might pop into Debenhams on payday and ask them to match me up to some products. To be honest i'd not heard a lot about GinZing but i'm glad I tried it because I really love it! I'd suggest going to a counter too so you can try out some of the products and make sure you're getting the right things for your skin type.